Last night at the Sydney Go Users’ meetup, Jason Buberel, product manager for the Go project, gave an excellent presentation on a product manager’s perspective on the Go project. 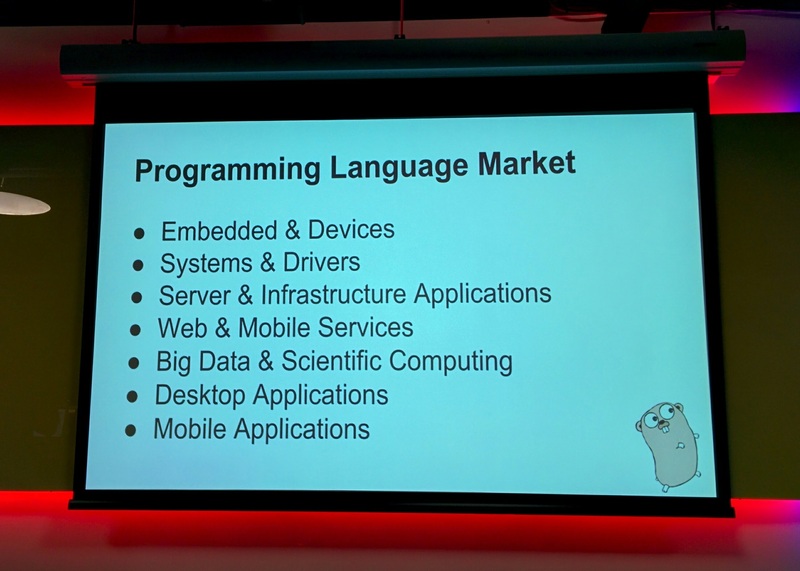 As part of his presentation, Buberel broke down the marketplace for a programming language into seven segments. As a thought experiment, I’ve taken Buberel’s market segments and applied them across a bunch of contemporary languages. Disclaimer: I’m not a product manager, I’ve just seen one on stage. Is your favourite language missing ? Feel free to print this table out and draw in the missing row. Scoring system: 0 – no presence, lack of interest or technical limitation. 1 – emerging presence or proof of concept. 2 – active competitor. 3 – market leader. If there is a conclusion to be drawn from this rather unscientific study, every language is in competition to be the language of the backend. As for the other market segments, everyone competes with C and C++, even Java. The internet of things that are too small to run linux; micrcontrollers, arduino, esp8266, etc. Can you write a kernel, kernel module, or operating system in it ? Monitoring systems, databases, configuration management systems, that sort of thing. Web application backends, REST APIs, microservices of all sorts. Desktop applications, including games, because the mobile applications category would certainly include games. OpenGL libraries or SDL bindings. Python is a popular scripting language for games. Servo, the browser rendering engine is targeting Firefox. Thanks to @rakyll for reminding me about the Blu Ray drives, and j2me running in everyone’s credit cards. This entry was posted in Programming, Small ideas and tagged competition on October 30, 2015 by Dave Cheney.